Heatwaves, floods, tropical cyclones, tornadoes, and bushfires occurred across Australia. Climate change is influencing the intensity of all extreme weather, and it's likely to get worse without strong action. The Climate Commission has received questions from the community and the media seeking to understand the influence of climate change on the recent extreme summer weather. This report provides a summary of the extreme weather of the 2012/13 summer and the influence of climate change on such events. 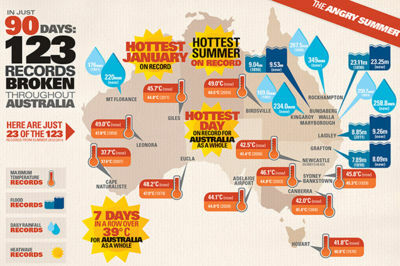 The Australian summer over 2012 and 2013 has been defined by extreme weather events across much of the continent, including record-breaking heat, severe bushfires, extreme rainfall and damaging flooding. Extreme heatwaves and catastrophic bushfire conditions during the Angry Summer were made worse by climate change. All weather, including extreme weather events is influenced by climate change. All extreme weather events are now occurring in a climate system that is warmer and moister than it was 50 years ago. This influences the nature, impact and intensity of extreme weather events. Australia’s Angry Summer shows that climate change is already adversely affecting Australians. The significant impacts of extreme weather on people, property, communities and the environment highlight the serious consequences of failing to adequately address climate change. It is highly likely that extreme hot weather will become even more frequent and severe in Australia and around the globe, over the coming decades. The decisions we make this decade will largely determine the severity of climate change and its influence on extreme events for our grandchildren. It is critical that we are aware of the influence of climate change on many types of extreme weather so that communities, emergency services and governments prepare for the risk of increasingly severe and frequent extreme weather. The heatwave contributed to Australian mean temperatures for November being 1.28 °C above normal, the nation’s sixth-warmest November on record. In Melbourne, the temperature is expected to reache 30-plus degrees over a 10-day stretch, which will smash the previous longest run of such heat by two days. The last time the city had eight consecutive days like this was February 1961. This page was last modified 22:26, 15 January 2014.